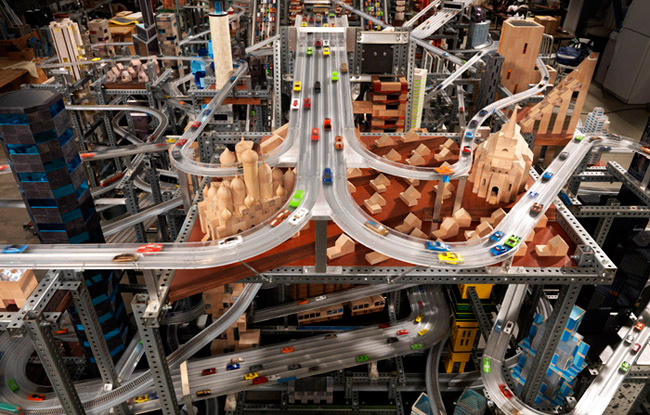 The blogs have been buzzing about California artist Chris Burden’s toy-car megalopolis project, Metropolis II, for ages. The latest news: A collector bought the installation for “millions” of dollars, but was gracious enough to donate it to the Los Angeles County Museum of Art for display over the next 10 years. (Whew!) But what does it take to design something like Metropolis II, and what does it all mean, anyway? 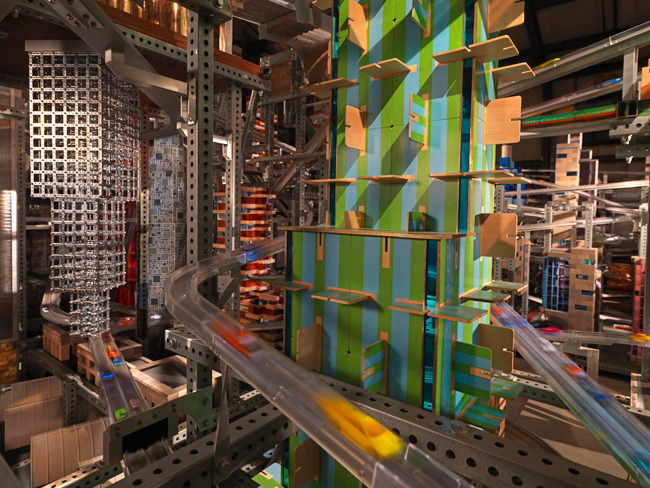 It took Burden and his chief engineer four years to make Metropolis II. The braking comes from walls that rise when the roads curve. Burden and Cook added some clever design solutions to control the traffic flow and minimize catastrophes. The subtlest, says Burden, are lane-dividing medians on the tiny roadways that taper to a point from the bottom to the top edge on straightaways, but remain fully vertical in curves. The reason: braking. When the cars enter a curve, the walls of the medians touch with rims of their wheels and the friction slows them down; when they come out of the curve, the tapered medians don’t touch the wheel rims anymore, allowing the cars to pick up speed again on straightaways and keep the flow moving swiftly. When they reach the bottom, magnets in the track catch on and pull them back up a slope to the top like a roller coaster, where they are released once again to gravity’s pull. Burden also has Metropolis II‘s cars specially manufactured in China to his custom specifications — unlike Metropolis I, which just used off-the-shelf Hot Wheels toys. “The original toy cars have very thin axles that wear out too fast,” says Burden. Given that Metropolis II is supposed to run three days a week for the next 10 years, how will it avoid the “wearing out” problem? Burden’s no-nonsense answer: “We made a lot of cars.” He says Metropolis II will go on exhibit at the Los Angeles County Museum of Art sometime this fall.